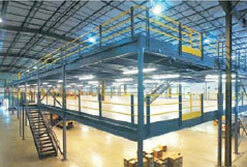 We are engaged in manufacturing and supplying Mezzanine Racks. The Mezzanine Rack use floor ground as support & can be designed to several floors, (normally 2-3 floors) and equipped with stairs or goods lift and barriers etc. This Mezzanine Rack is often used in roomy storehouse with lightweight goods, manual operated, huge storing quantity; over 50% of the storehouse, utilizing can be reached. We can provide all kinds of customized Mezzanine rack.